From the outset of our architects’ conceptual design work, it was recognized that we would need to connect the B.C. Government’s rest area to our building site by means of a bridge over Sucker Creek. The original plan was to build the bridge as part of the overall construction phase. However, during the spring of 2014, we became aware that many vehicles – both snowmobiles in the winter months, but mainly ATVs in the summer and fall – had been taking a short cut from the forest to the Highway 97 underpass by fording the creek in fairly close proximity to the spot where we intended to build our bridge, and in doing so had inflicted severe damage to the bed and to the banks of the Creek. Thus was born the idea of protecting the Creek by building our bridge in advance of the main construction phase. In order to do so, we solicited the financial support of the local business communities of 100 Mile House and Williams Lake, and during the summer and fall of 2014 we received many extremely generous donations from those sources which in most cases were matched by ArtsVest BC which is an arm of Business for the Arts. Those businesses as well as the handful of individuals who contributed financially or in kind, were recognized in a newspaper advertisement that was run in both the 100 Mile Free Press and the Williams Lake Tribune, were listed in several of our monthly newsletters, and are noted on a plaque adjacent to the completed bridge. The amount we raised from the business communities and from individuals was not quite sufficient to carry out the environmental, design, engineering and construction work for the bridge, and the shortfall was met by an amazingly generous grant from the New Pathways to Gold Society. The initial design concept for the bridge was prepared by McFarland Marceau Architects Ltd. and engineered by Fast + Epp. 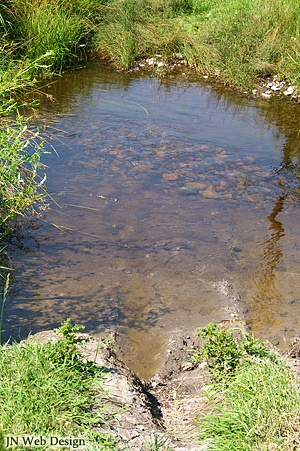 The final design and the construction were carried out by Celtic Engineering of Williams Lake, and the environmental work was conducted by Davis Environmental of the 108 Mile Ranch. 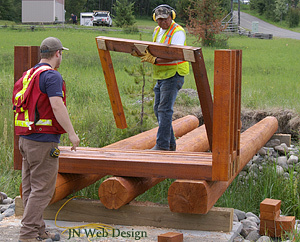 The foundations for the bridge were installed on June 1, 2015, using cedar log stringers supplied by Sitka Log Homes of 100 Mile House. The decking, posts and railings consisted of cedar, supplied in part by the Canim Lake Band and in part by Sitka Log Homes. 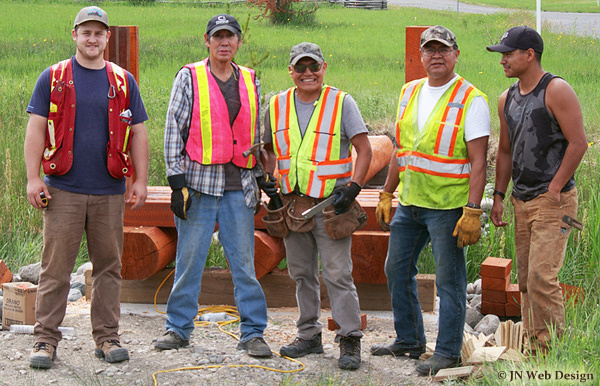 All the cedar was milled by Sitka and stained by a work crew from the Canim Lake Band, and the erection of the posts, railings and decking was carried out by the Canim Lake Band under Celtic Engineering’s supervision on June 24th and 25th. The two approaches to the bridge were completed on June 28th, bringing this project to its completion. 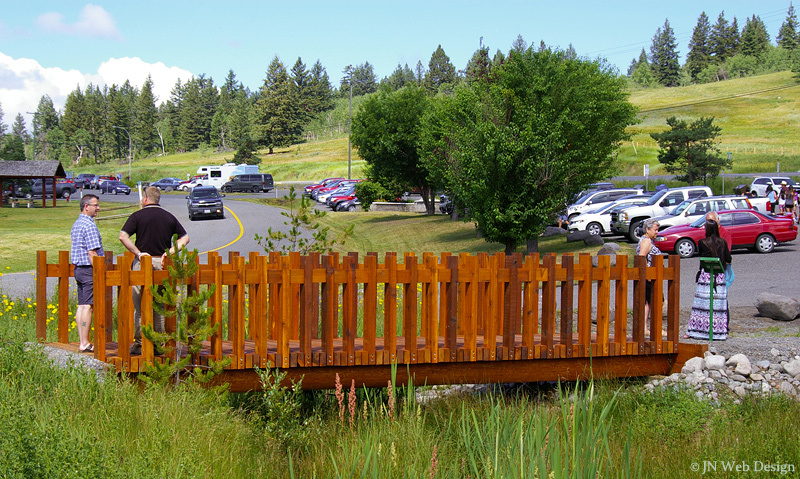 On Wednesday, July 1, 2015, we conducted a simple ceremony in order to honour the many local businesses that contributed financially and – together with ArtsVest B.C and the New Pathways to Gold Society – had made it possible to build the bridge at this time. 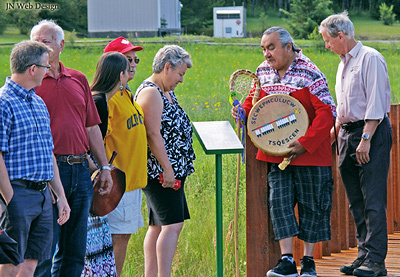 The ceremony was held slightly in advance of the opening of Canada Day celebrations at the 108 Heritage Site, and featured Canim Lake Band Chief Mike Archie saying an opening prayer in the Secwepemc (Shuswap) language and welcoming the numerous participants to the site of the new bridge; some drumming and singing by Band members from the Canim Lake and Soda Creek Bands; and some brief remarks to acknowledge the presence of most of those involved in construction of the bridge, namely Daryl Taylor of Celtic Engineering, Larry Davis of Davis Environmental, Brad Johnson of Sitka Log Homes and Marty Dixon of the Canim Lake Band. All of the businesses that contributed to the bridge project, were invited to attend this ceremony, and it was most gratifying that representatives of several local businesses were able to attend. 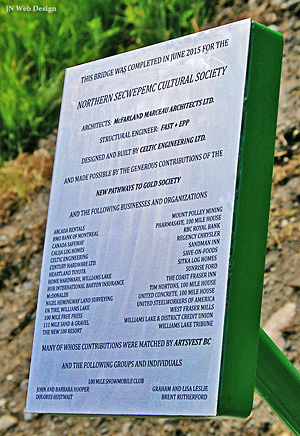 This new bridge which has attracted the most favourable compliments from all quarters, stands as a testimonial to the interest of the local business communities and to their great financial support, as well as the spirit of cooperation between the aboriginal and non-aboriginal communities in the South Cariboo. We are hoping that the bridge is the first of several mini projects that we may be able to carry out during the period when we seek the funding to carry out the major construction phase within the next few years.